I will not write my usual intro for this installment. Those of you who are following this story already know what has been happening. For you newcomers, please follow this link to the entire series. The following is Cash’s mom’s account of yesterday…surgery day. I have only edited this for grammar and punctuation. 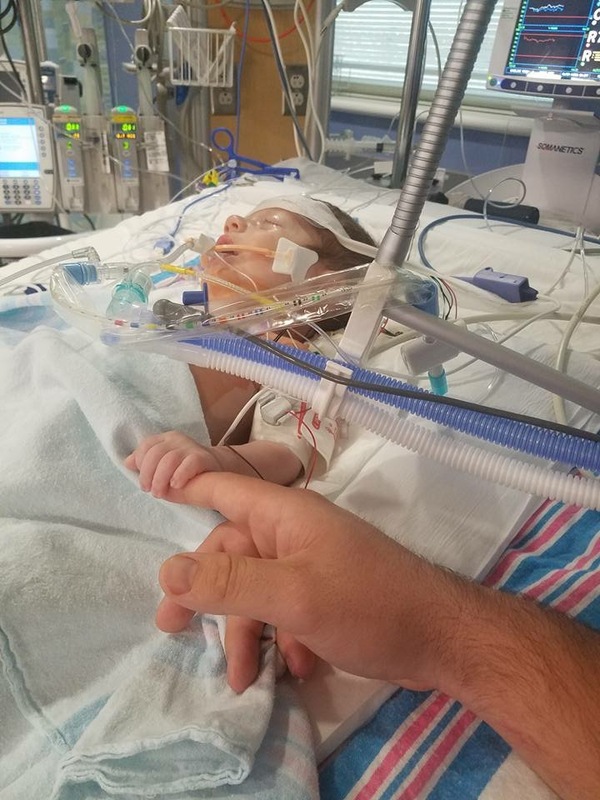 Ashley B is not only a loving and brave new mom, but she has a way of expressing her thoughts and feelings that will touch your heart as you feel her pain. And rejoice with their good news. “God is so good. Thank you everyone for the prayers. Please keep praying; our little Rockstar still has a few more hurdles to jump through. Last night I don’t think anyone rested. Around 5 pm we had to watch our little boy being held down and pricked several times for lab tests. Several hours later we were told they needed three more labs; he was held down and stuck several more times. His blood kept clotting and his veins were blown. It took several nurses to get two vials of blood. Upsetting him caused his already overworked little heart to push its limits to 215! Now it was 1 am. Our little man had to stop eating at midnight (he eats about every 3 to 4 hours), and with still one more lab to do…more bad news… his IV was leaking. Now it was 2 am and our little guy was screaming with us in tears while he is held down again and being poked some more. It was so heartbreaking. But after everything was finally over he smiled at us and went to sleep! At 5 am he had to be weighed and checked out. Now it was only two hours away from “go time”. He was very upset because he was so hungry. We were on edge trying to hold and love on him as much as we could. I wish I could have slowed down the clock. In the waiting room it seemed like hours, days, months. Then the phone rang at 9:05 am for the first time. That’s the hardest phone call to pick up. I had Coleman answer. The whole room was silent.. waiting for a reaction. Watching Coleman’s face and tone. You could hear a pin drop. He was stable, and they had begun. At 10:00 the phone rang again. He was on the heart-lung machine, meaning his heart was stopped and a machine was pumping blood for him. At 11:20 we had another call. He was off the heart-lung machine! About 12:00 one of the surgeons cane out. Again, we all sat there trying to read him; trying to guess and prepare for what he was going to say. “Everything went beautifully! They are stiching him up now.” We all took a deep breath. A huge weight lifted. With tears of joy I thanked God over and over again. I could have leaped into the surgeon’s arms and given him a huge hug. Not long afterwards, the second surgeon came out and explained there was a little bit of a heart rhythm issue that Cash was having. Now it was a waiting game again as to when we would see him. No one can ever prepare you enough for seeing what we had to see our precious little warrior going through. I cannot even put it into words what it was like seeing him for the first time after surgery. It was my baby but not my spunky lil smiley-funny-face making baby. He looked like a doll as a machine breathed for him. A drain tube from his heart was coming out of his stomach. He had a catheter, 3 IV’s (one in his foot, one in his arm and a big one in his neck). A breathing tube took up his tiny little face, along with pacemaker wires and several other wires and tubes. I thought seeing him would be the hardest, but no, it got worse watching him fight through the sedation, waking up and kicking. Watching him cry, but with his eyes closed and no noises coming out. Now that’s hard. Because now you know he is uncomfortable, and you can’t pick him up and love on him; you can’t kiss his sweet little face. 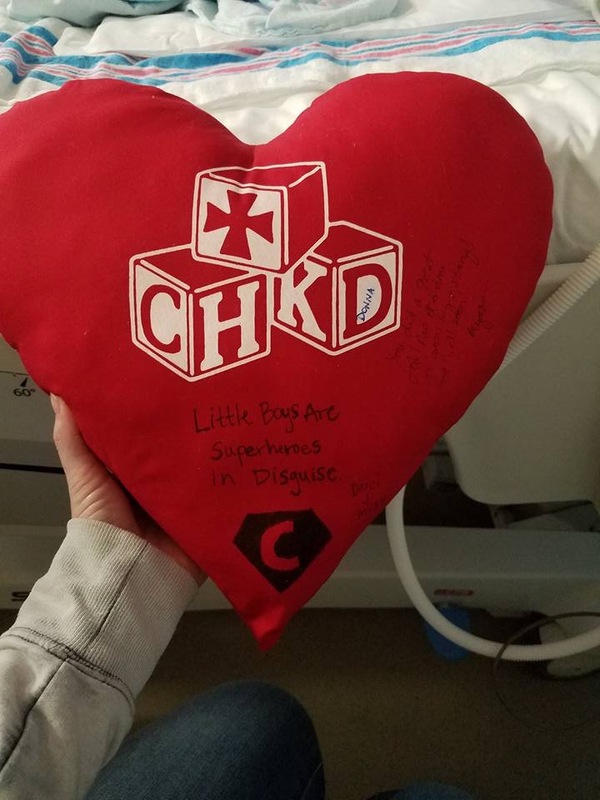 We were told the breathing tube would be removed shortly after surgey, however Cash had some swelling that hopefully will go down by the use of steroids, but it cannot be removed until this happens. This week has been so hard. Cash is such a fighter. I love that little boy more then he will ever know. He is a true miracle from God. Tomorrow [actually today, since this was written on October 11] is a new day; our 2 year wedding anniversary. And although this is definitely not the way we planned on spending it, we received the greatest gift ever. We are blessed that we will get to spend it together, even it if is in ICU. Our baby’s huge hole in his heart was fixed today.